Ductility is a measure of a material's ability to undergo significant plastic deformation before rupture, which may be expressed as percent elongation or percent area reduction from a tensile test. According to Shigley's Mechanical Engineering Design significant denotes about 5.0 percent elongation. See also Eq. 2–12, p. 50 for definitions of percent elongation and percent area reduction. Ductility is often characterized by a material's ability to be stretched into a wire. Corrosion is a natural process, which converts a refined metal to a more chemically-stable form, such as its oxide, hydroxide, or sulfide. It is the gradual destruction of materials by chemical and/or electrochemical reaction with their environment. Corrosion engineering is the field dedicated to controlling and stopping corrosion. Despite its prevalence in the environment, no known form of life uses aluminium salts metabolically, but aluminium is well tolerated by plants and animals. Because of these salts' abundance, the potential for a biological role for them is of continuing interest, and studies continue. is stable. This is consistent with aluminium having an odd atomic number. 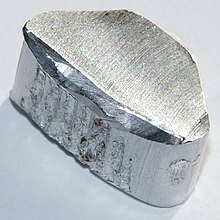 [lower-alpha 1] It is the only aluminium isotope that has existed on Earth in its current form since the creation of the planet. Very nearly all the element on Earth is present as this isotope, which makes aluminium a mononuclidic element and means that its standard atomic weight practically equates to that of the isotope. 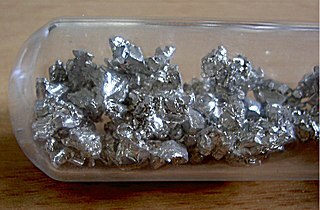 The standard atomic weight of aluminium is low in comparison with many other metals, [lower-alpha 2] which has consequences for the element's properties (see below). A mononuclidic element or monotopic element is one of the 22 chemical elements that is found naturally on Earth essentially as a single nuclide. 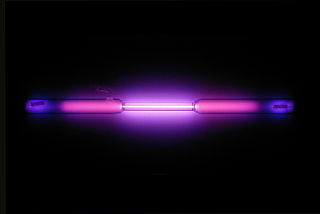 This single nuclide will have a characteristic atomic mass. Thus, the element's natural isotopic abundance is dominated either by one stable isotope or by one very long-lived isotope. There are 19 elements in the first category, and 3 in the second category. A list of the 22 mononuclidic elements is given at the end of this article. The standard atomic weight is the atomic weight (Ar) of a chemical element, as appearing and met in the earthly environment. It reflects the variance of natural isotopes of an element. Values are defined by the IUPAC (CIAAW) definition of natural, stable, terrestrial sources. It is the most common and practical atomic weight used, for example to determine molar mass. Aluminium metal, when in quantity, is very shiny and resembles silver because it preferentially absorbs far ultraviolet radiation while reflecting all visible light so it does not impart any color to reflected light, unlike the reflectance spectra of copper and gold. Another important characteristic of aluminium is its low density, 2.70 g/cm3. [lower-alpha 3] Aluminium is a relatively soft, durable, lightweight, ductile, and malleable with appearance ranging from silvery to dull gray, depending on the surface roughness. It is nonmagnetic and does not easily ignite. A fresh film of aluminium serves as a good reflector (approximately 92%) of visible light and an excellent reflector (as much as 98%) of medium and far infrared radiation. The yield strength of pure aluminium is 7–11 MPa, while aluminium alloys have yield strengths ranging from 200 MPa to 600 MPa. Aluminium has about one-third the density and stiffness of steel. It is easily machined, cast, drawn and extruded. Aluminium's corrosion resistance can be excellent due to a thin surface layer of aluminium oxide that forms when the bare metal is exposed to air, effectively preventing further oxidation,  in a process termed passivation. The strongest aluminium alloys are less corrosion resistant due to galvanic reactions with alloyed copper. This corrosion resistance is greatly reduced by aqueous salts, particularly in the presence of dissimilar metals. Aluminium forms one stable oxide with the chemical formula Al2O3. It can be found in nature in the mineral corundum. Aluminium oxide is also commonly called alumina. Sapphire and ruby are impure corundum contaminated with trace amounts of other metals. The two oxide-hydroxides, AlO(OH), are boehmite and diaspore. There are three trihydroxides: bayerite, gibbsite, and nordstrandite, which differ in their crystalline structure (polymorphs). Most are produced from ores by a variety of wet processes using acid and base. Heating the hydroxides leads to formation of corundum. These materials are of central importance to the production of aluminium and are themselves extremely useful. A stable derivative of aluminium monoiodide is the cyclic adduct formed with triethylamine, Al4I4(NEt3)4. Also of theoretical interest but only of fleeting existence are Al2O and Al2S. 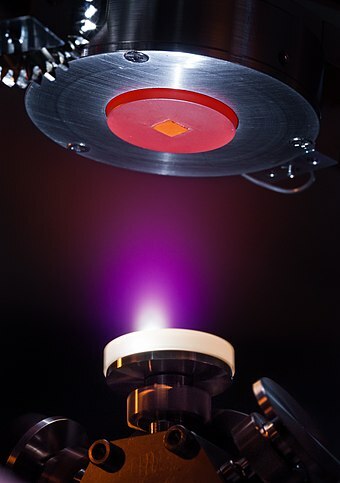 Al2O is made by heating the normal oxide, Al2O3, with silicon at 1,800 °C (3,272 °F) in a vacuum. Such materials quickly disproportionate to the starting materials. A variety of compounds of empirical formula AlR3 and AlR1.5Cl1.5 exist. These species usually feature tetrahedral Al centers formed by dimerization with some R or Cl bridging between both Al atoms, e.g. "trimethylaluminium" has the formula Al2(CH3)6 (see figure). With large organic groups, triorganoaluminium compounds exist as three-coordinate monomers, such as triisobutylaluminium. Such compounds[ which? ] are widely used in industrial chemistry, despite the fact that they are often highly pyrophoric. Few analogues exist between organoaluminium and organoboron compounds other than[ clarification needed ] large organic groups. There are five major aluminium forms absorbed by human body: the free solvated trivalent cation (Al(aq)); low-molecular-weight, neutral, soluble complexes (LMW-Al(aq)); high-molecular-weight, neutral, soluble complexes (HMW-Al(aq)); low-molecular-weight, charged, soluble complexes (LMW-Al(L)n(aq)); nano and micro-particulates (Al(L)n(s)). 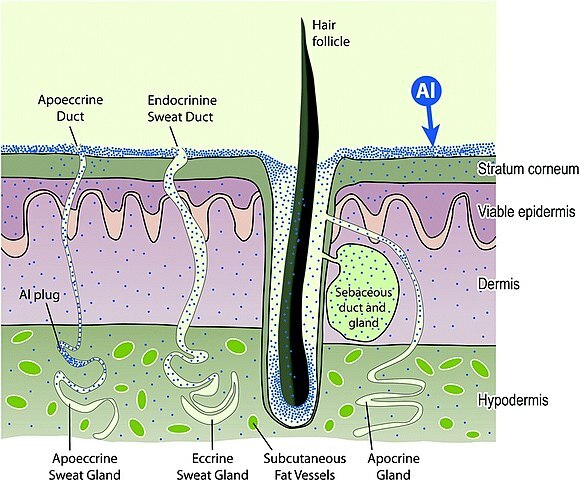 They are transported across cell membranes or cell epi-/endothelia through five major routes: (1) paracellular; (2) transcellular; (3) active transport; (4) channels; (5) adsorptive or receptor-mediated endocytosis. ↑ No elements with odd atomic numbers have more than two stable isotopes; even-numbered elements have multiple stable isotopes, with tin (element 50) having the highest number of isotopes of all elements, ten. 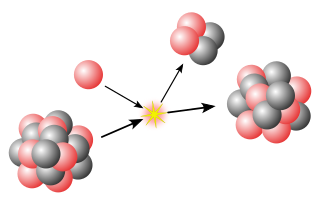 See Even and odd atomic nuclei for more details. ↑ Aluminium's low density (compared to the other metals) arises from the fact that its nuclei are much lighter, while difference in the unit cell size does not compensate for this difference. ↑ Abundances in the source are listed relative to silicon rather than in per-particle notation. The sum of all elements per 106 parts of silicon is 2.6682×1010 parts; aluminium comprises 8.410×104 parts. Gallium is a chemical element with symbol Ga and atomic number 31. Gallium in its solid state is slightly blue; however in its liquid state it becomes silvery white. Gallium is soft enough to be cut with shears however; if too much force is applied Gallium may fracture conchoidally. It is in group 13 of the periodic table, and thus has similarities to the other metals of the group, aluminium, indium, and thallium. Gallium does not occur as a free element in nature, but as gallium(III) compounds in trace amounts in zinc ores and in bauxite. Elemental gallium is a liquid at temperatures greater than 29.76 °C (85.57 °F). The boron group are the chemical elements in group 13 of the periodic table, comprising boron (B), aluminium (Al), gallium (Ga), indium (In), thallium (Tl), and perhaps also the chemically uncharacterized nihonium (Nh). The elements in the boron group are characterized by having three electrons in their outer energy levels. These elements have also been referred to as the triels. The Hall–Héroult process is the major industrial process for smelting aluminium. 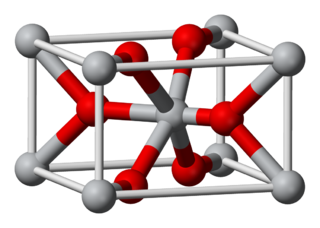 It involves dissolving aluminium oxide (alumina) in molten cryolite, and electrolysing the molten salt bath, typically in a purpose-built cell. The Hall–Héroult process applied at industrial scale happens at 940–980°C and produces 99.5–99.8% pure aluminium. Recycled aluminum requires no electrolysis, thus it does not end up in this process. In chemistry, an aluminate is a compound containing an oxyanion of aluminium, such as sodium aluminate. In the naming of inorganic compounds, it is a suffix that indicates a polyatomic anion with a central aluminum atom. Aluminum carbide, chemical formula Al4C3, is a carbide of aluminum. It has the appearance of pale yellow to brown crystals. It is stable up to 1400 °C. It decomposes in water with the production of methane. 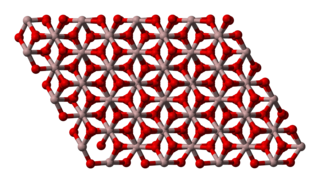 Yttrium is a chemical element with symbol Y and atomic number 39. It is a silvery-metallic transition metal chemically similar to the lanthanides and has often been classified as a "rare-earth element". 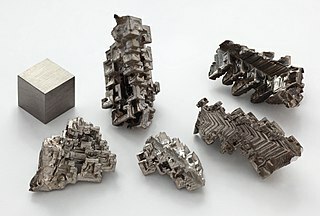 Yttrium is almost always found in combination with lanthanide elements in rare-earth minerals, and is never found in nature as a free element. 89Y is the only stable isotope, and the only isotope found in the Earth's crust. Aluminium or aluminum is a chemical element with symbol Al and atomic number 13. At standard conditions, aluminium forms a bright silvery metal; this metal is unusually light and resistant against corrosion. Chemically, aluminium is a main-group element that normally assumes the +3 oxidation state. Aluminium is the third most abundant element in the Earth's crust; as such, it is widespread in human-related activities. Aluminium is produced in tens of millions of metric tons; the metal is commonly alloyed to improve some characteristics, such as hardness. 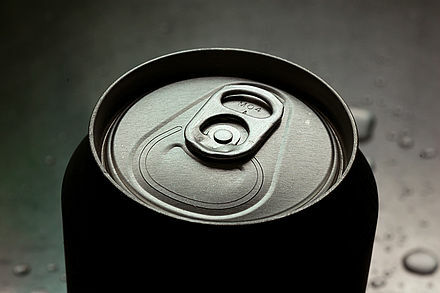 Aluminium has no biological role but is not particularly toxic. 1 2 Meija, Juris; et al. (2016). "Atomic weights of the elements 2013 (IUPAC Technical Report)". Pure and Applied Chemistry . 88 (3): 265–91. doi: 10.1515/pac-2015-0305 . ↑ Dohmeier, C.; Loos, D.; Schnöckel, H. (1996). "Aluminum(I) and Gallium(I) Compounds: Syntheses, Structures, and Reactions". Angewandte Chemie International Edition. 35: 129–149. doi:10.1002/anie.199601291. ↑ D. C. Tyte (1964). "Red (B2Π–A2σ) Band System of Aluminium Monoxide". Nature. 202 (4930): 383. Bibcode:1964Natur.202..383T. doi:10.1038/202383a0. ↑ Lide, D. R. (2000). "Magnetic susceptibility of the elements and inorganic compounds" (PDF). CRC Handbook of Chemistry and Physics (81st ed.). CRC Press. ISBN 0849304814. 1 2 Singh, Bikram Jit (2014). RSM: A Key to Optimize Machining: Multi-Response Optimization of CNC Turning with Al-7020 Alloy. Anchor Academic Publishing (aap_verlag). ISBN 978-3-95489-209-9. ↑ Hihara, Lloyd H.; Adler, Ralph P.I. ; Latanision, Ronald M. (2013). Environmental Degradation of Advanced and Traditional Engineering Materials. CRC Press. 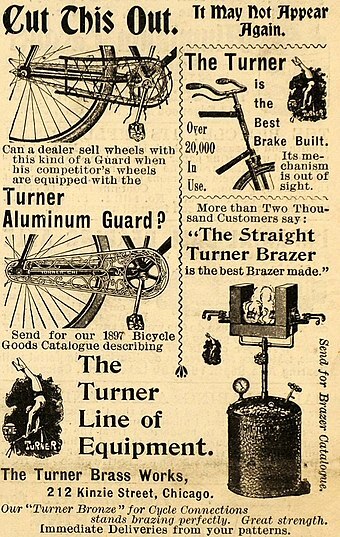 ISBN 978-1-4398-1927-2. 1 2 3 4 5 6 Frank, W.B. (2009). "Aluminum". Ullmann's Encyclopedia of Industrial Chemistry. Wiley-VCH. doi:10.1002/14356007.a01_459.pub2. ISBN 978-3-527-30673-2. 1 2 IAEA – Nuclear Data Section (2017). "Livechart – Table of Nuclides – Nuclear structure and decay data". www-nds.iaea.org. International Atomic Energy Agency . Retrieved 31 March 2017. ↑ Dickin, A.P. (2005). "In situ Cosmogenic Isotopes". Radiogenic Isotope Geology. Cambridge University Press. ISBN 978-0-521-53017-0. Archived from the original on 6 December 2008. Retrieved 16 July 2008. ↑ Dodd, R.T. (1986). Thunderstones and Shooting Stars. Harvard University Press. pp. 89–90. ISBN 978-0-674-89137-1. ↑ Dean 1999, p. 4.2. ↑ Dean 1999, p. 4.29. 1 2 Dean 1999, p. 4.30. ↑ Enghag, Per (2008). Encyclopedia of the Elements: Technical Data – History – Processing – Applications. John Wiley & Sons. pp. 139, 819, 949. ISBN 978-3-527-61234-5. ↑ Lide 2004, p. 4-3. 1 2 Polmear, I.J. (1995). Light Alloys: Metallurgy of the Light Metals (3 ed.). Butterworth-Heinemann. ISBN 978-0-340-63207-9. ↑ Dieter, G.E. (1988). Mechanical Metallurgy. McGraw-Hill. ISBN 978-0-07-016893-0. ↑ Cochran, J.F. ; Mapother, D.E. 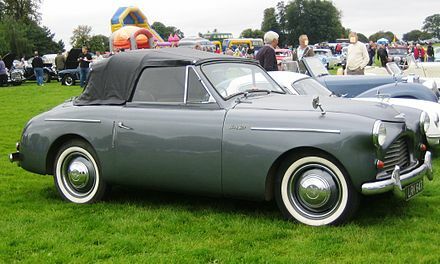 (1958). "Superconducting Transition in Aluminum". Physical Review . 111 (1): 132–142. Bibcode:1958PhRv..111..132C. doi:10.1103/PhysRev.111.132. ↑ Devoret, M.H. ; Schoelkopf, R.J. (2013). "Superconducting Circuits for Quantum Information: An Outlook". Science . 339 (6124): 1169–1174. Bibcode:2013Sci...339.1169D. doi:10.1126/science.1231930. PMID 23471399. ↑ Vargel, Christian (2004) [French edition published 1999]. Corrosion of Aluminium. Elsevier. ISBN 978-0-08-044495-6. Archived from the original on 21 May 2016. ↑ Beal, Roy E. (1999). Engine Coolant Testing : Fourth Volume. ASTM International. p. 90. ISBN 978-0-8031-2610-7. Archived from the original on 24 April 2016. ↑ Macleod, H.A. (2001). Thin-film optical filters. CRC Press. p. 158159. ISBN 978-0-7503-0688-1. ↑ "Reaction of Aluminum with Water to Produce Hydrogen" (PDF). U.S. Department of Energy. 1 January 2008. Archived from the original (PDF) on 14 September 2012. 1 2 Greenwood, Norman N.; Earnshaw, Alan (1997). Chemistry of the Elements (2nd ed.). Butterworth-Heinemann. p. 217. ISBN 978-0-08-037941-8. Baes, C.F. ; Mesmer, R.E. (1986) . The Hydrolysis of Cations. Malabar, FL: Robert E. Krieger. ISBN 978-0-89874-892-5. ↑ Roscoe, Henry Enfield; Schorlemmer, Carl (1913). A treatise on chemistry. Macmillan. ↑ Eastaugh, Nicholas; Walsh, Valentine; Chaplin, Tracey; Siddall, Ruth (2008). Pigment Compendium. Routledge. ISBN 978-1-136-37393-0. 1 2 Dohmeier, C.; Loos, D.; Schnöckel, H. (1996). "Aluminum(I) and Gallium(I) Compounds: Syntheses, Structures, and Reactions". Angewandte Chemie International Edition . 35 (2): 129–149. doi:10.1002/anie.199601291. ↑ Tyte, D.C. (1964). "Red (B2Π–A2σ) Band System of Aluminium Monoxide". Nature . 202 (4930): 383–384. Bibcode:1964Natur.202..383T. doi:10.1038/202383a0. ↑ Merrill, P.W. ; Deutsch, A.J. ; Keenan, P.C. (1962). "Absorption Spectra of M-Type Mira Variables". The Astrophysical Journal . 136: 21. Bibcode:1962ApJ...136...21M. doi:10.1086/147348. ↑ Uhl, W. (2004). "Organoelement Compounds Possessing AlAl, GaGa, InIn, and TlTl Single Bonds". Organoelement Compounds Possessing Al–Al, Ga–Ga, In–In, and Tl–Tl Single Bonds. Advances in Organometallic Chemistry. 51. pp. 53–108. doi:10.1016/S0065-3055(03)51002-4. ISBN 978-0-12-031151-4. ↑ Elschenbroich, C. (2006). Organometallics. Wiley-VCH. ISBN 978-3-527-29390-2. 1 2 Lodders, K. (2003). "Solar System abundances and condensation temperatures of the elements" (PDF). The Astrophysical Journal . 591 (2): 1220–1247. Bibcode:2003ApJ...591.1220L. doi:10.1086/375492. ISSN 0004-637X. 1 2 3 Clayton, Donald (2007). Handbook of Isotopes in the Cosmos: Hydrogen to Gallium. Cambridge University Press. pp. 129–137. ISBN 978-0-521-53083-5. ↑ William F McDonough The composition of the Earth. quake.mit.edu, archived by the Internet Archive Wayback Machine. ↑ Wade, K.; Banister, A.J. (2016). The Chemistry of Aluminium, Gallium, Indium and Thallium: Comprehensive Inorganic Chemistry. Elsevier. p. 1049. ISBN 978-1-4831-5322-3. ↑ Palme, H.; O'Neill, Hugh St. C. (2005). "Cosmochemical Estimates of Mantle Composition" (PDF). In Carlson, Richard W. The Mantle and Core. Elseiver. p. 14. ↑ Downs, A.J. (1993). Chemistry of Aluminium, Gallium, Indium and Thallium. Springer Science & Business Media. ISBN 978-0-7514-0103-5. ↑ Kotz, John C.; Treichel, Paul M.; Townsend, John (2012). Chemistry and Chemical Reactivity. Cengage Learning. p. 300. ISBN 978-1-133-42007-1. ↑ Barthelmy, D. "Aluminum Mineral Data". Mineralogy Database. Archived from the original on 4 July 2008. Retrieved 9 July 2008. ↑ Chen, Z.; Huang, Chi-Yue; Zhao, Meixun; Yan, Wen; Chien, Chih-Wei; Chen, Muhong; Yang, Huaping; Machiyama, Hideaki; Lin, Saulwood (2011). "Characteristics and possible origin of native aluminum in cold seep sediments from the northeastern South China Sea". Journal of Asian Earth Sciences. 40 (1): 363–370. Bibcode:2011JAESc..40..363C. doi:10.1016/j.jseaes.2010.06.006. ↑ Guilbert, J.F. ; Park, C.F. (1986). The Geology of Ore Deposits. W.H. Freeman. pp. 774–795. ISBN 978-0-7167-1456-9. ↑ United States Geological Survey (2018). "Bauxite and alumina" (PDF). Mineral Commodities Summaries. Retrieved 17 June 2018. 1 2 Drozdov 2007, p. 12. ↑ Clapham, John Harold; Power, Eileen Edna (1941). The Cambridge Economic History of Europe: From the Decline of the Roman Empire. CUP Archive. p. 207. ISBN 978-0-521-08710-0. ↑ Drozdov 2007, p. 16. ↑ Setton, Kenneth M. (1976). The papacy and the Levant: 1204-1571. 1 The thirteenth and fourteenth centuries. American Philosophical Society. ISBN 978-0-87169-127-9. OCLC 165383496. ↑ Drozdov 2007, p. 25. ↑ Weeks, Mary Elvira (1968). Discovery of the elements. 1 (7 ed.). Journal of chemical education. p. 187. 1 2 Richards 1896, p. 2. ↑ Richards 1896, p. 3. ↑ Royal Danish Academy of Sciences and Letters (1827). Det Kongelige Danske Videnskabernes Selskabs philosophiske og historiske afhandlinger [The philosophical and historical dissertations of the Royal Danish Science Society] (in Danish). Popp. pp. xxv–xxvi. 1 2 Wöhler, Friedrich (1827). 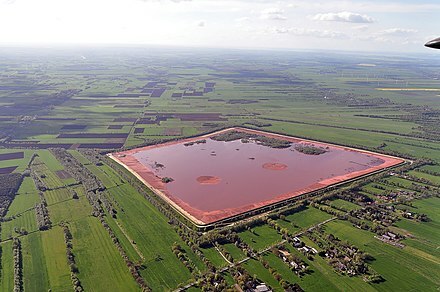 "Ueber das Aluminium". Annalen der Physik und Chemie . 2. 11: 146–161. ↑ Drozdov 2007, p. 36. ↑ Fontani, Marco; Costa, Mariagrazia; Orna, Mary Virginia (2014). The Lost Elements: The Periodic Table's Shadow Side. Oxford University Press. p. 30. ISBN 978-0-19-938334-4. 1 2 Venetski, S. (1969). "'Silver' from clay". Metallurgist. 13 (7): 451–453. doi:10.1007/BF00741130. 1 2 Drozdov 2007, p. 38. ↑ Holmes, Harry N. (1936). "Fifty Years of Industrial Aluminum". The Scientific Monthly. 42 (3): 236–239. JSTOR 15938. 1 2 Drozdov 2007, p. 39. ↑ Sainte-Claire Deville, H.E. (1859). De l'aluminium, ses propriétés, sa fabrication. Paris: Mallet-Bachelier. Archived from the original on 30 April 2016. ↑ Polmear, Ian (2005). 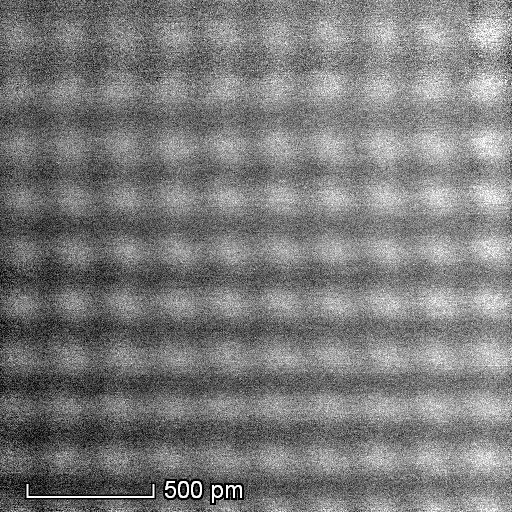 Light Alloys: From Traditional Alloys to Nanocrystals. Butterworth-Heinemann. p. 15. ISBN 978-0-08-049610-8. ↑ Drozdov 2007, p. 46. ↑ Drozdov 2007, pp. 55–61. ↑ Drozdov 2007, p. 74. 1 2 3 "Aluminium history". All about aluminium. Retrieved 7 November 2017. ↑ Drozdov 2007, pp. 64–69. ↑ Ingulstad, Mats (2012). "'We Want Aluminum, No Excuses': Business-Government Relations in the American Aluminum Industry, 1917–1957". In Ingulstad, Mats; Frøland, Hans Otto. 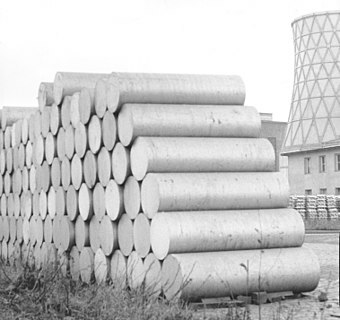 From Warfare to Welfare: Business-Government Relations in the Aluminium Industry. Tapir Academic Press. pp. 33–68. ISBN 978-82-321-0049-1. ↑ Drozdov 2007, pp. 69–70. ↑ Drozdov 2007, pp. 165–166. ↑ Drozdov 2007, p. 85. ↑ Drozdov 2007, p. 135. 1 2 3 "Aluminum". Historical Statistics for Mineral Commodities in the United States (Report). United States Geological Survey. 2017. Retrieved 9 November 2017. ↑ Nappi 2013, p. 9. ↑ Nappi 2013, pp. 9–10. ↑ Nappi 2013, p. 10. ↑ Nappi 2013, pp. 14–15. ↑ Nappi 2013, p. 17. ↑ Nappi 2013, p. 20. ↑ Nappi 2013, p. 22. ↑ Nappi 2013, p. 23. ↑ Harper, Douglas. "Alum". Online Etymology Dictionary . Retrieved 13 November 2017. ↑ Pokorny, Julius (1959). "alu- (-d-, -t-)". Indogermanisches etymologisches Wörterbuch [Indo-European etymological dictionary] (in German). A. Francke Verlag. pp. 33–34. ↑ Davy, Humphry (1808). "Electro Chemical Researches, on the Decomposition of the Earths; with Observations on the Metals obtained from the alkaline Earths, and on the Amalgam procured from Ammonia". Philosophical Transactions of the Royal Society. 98: 353. doi: 10.1098/rstl.1808.0023 . Retrieved 10 December 2009. ↑ Richards 1896, pp. 3–4. ↑ Davy, Humphry (1812). "Of metals; their primary compositions with other uncompounded bodies, and with each other". Elements of Chemical Philosophy: Part 1. 1. Bradford and Inskeep. p. 201. 1 2 3 Powell, Mike (2015). Amglish: Two Nations Divided by a Common Language. BookBaby. p. 138. ISBN 978-1-4835-5100-5. ↑ Cutmore, Jonathan (February 2005). "Quarterly Review Archive". Romantic Circles. University of Maryland. Archived from the original on 1 March 2017. Retrieved 28 February 2017. ↑ Young, Thomas (1812). Elements of Chemical Philosophy By Sir Humphry Davy. Quarterly Review. VIII. p. 72. ISBN 978-0-217-88947-6. 210. Retrieved 10 December 2009. 1 2 Quinion, Michael (2005). Port Out, Starboard Home: The Fascinating Stories We Tell About the words We Use. Penguin Books Limited. pp. 23–24. ISBN 978-0-14-190904-2. ↑ Richards 1896, p. 4. ↑ Webster, Noah (1828). "aluminum". American Dictionary of the English Language . Retrieved 13 November 2017. 1 2 "Aluminum vs Aluminium". Spectra Aluminum Products. Retrieved 13 November 2017. 1 2 3 Emsley, John (2011). Nature's Building Blocks: An A–Z Guide to the Elements. OUP Oxford. pp. 24–30. ISBN 978-0-19-960563-7. 1 2 3 Brown, T.J.; Idoine, N.E. ; Raycraft, E.R. ; et al. (2018). World Mineral Production: 2012–2016. British Geological Survey. ISBN 978-0-85272-882-6. ↑ Brown, T.J. (2009). 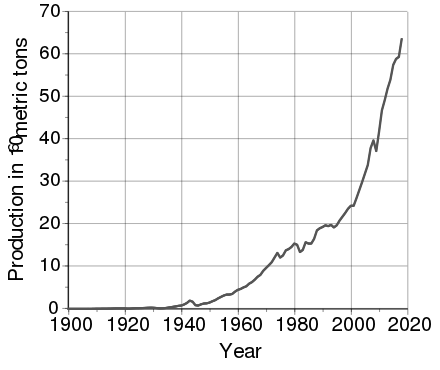 World Mineral Production 2003–2007. British Geological Survey. ↑ "Top 10 Largest Aluminium Smelters in the World". Gulf Business. 2013. Retrieved 2018-06-25. ↑ Graedel, T.E. ; et al. (2010). Metal stocks in Society – Scientific Synthesis (PDF) (Report). International Resource Panel. p. 17. ISBN 978-92-807-3082-1 . Retrieved 18 April 2017. 1 2 3 4 5 Hudson, L. Keith; Misra, Chanakya; Perrotta, Anthony J.; et al. (2005). "Aluminum Oxide". Ullmann's Encyclopedia of Industrial Chemistry. Wiley-VCH. ↑ Totten, G.E. ; Mackenzie, D.S. (2003). Handbook of Aluminum. Marcel Dekker. p. 40. ISBN 978-0-8247-4843-2. Archived from the original on 15 June 2016. ↑ Schlesinger, Mark (2006). Aluminum Recycling. CRC Press. p. 248. ISBN 978-0-8493-9662-5. 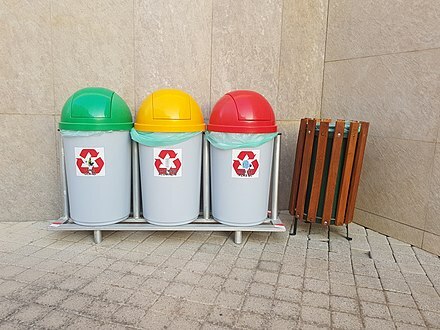 ↑ "Benefits of Recycling". Ohio Department of Natural Resources. Archived from the original on 24 June 2003. ↑ "Theoretical/Best Practice Energy Use in Metalcasting Operations" (PDF). Archived from the original (PDF) on 31 October 2013. Retrieved 28 October 2013. ↑ "Why are dross & saltcake a concern?". www.experts123.com. Archived from the original on 14 November 2012. ↑ Dunster, A.M.; et al. (2005). "Added value of using new industrial waste streams as secondary aggregates in both concrete and asphalt" (PDF). Waste & Resources Action Programme. Archived from the original on 2010-04-02. ↑ "Aluminum". Encyclopædia Britannica . Archived from the original on 12 March 2012. Retrieved 6 March 2012. ↑ Millberg, L.S. "Aluminum Foil". How Products are Made. Archived from the original on 13 July 2007. Retrieved 11 August 2007. ↑ Lyle, J.P.; Granger, D.A. ; Sanders, R.E. (2005). "Aluminum Alloys". Ullmann's Encyclopedia of Industrial Chemistry. Wiley-VCH. doi:10.1002/14356007.a01_481. ISBN 978-3-527-30673-2. ↑ Davis, Joseph R. (1993). Aluminum and Aluminum Alloys. ASM International. pp. 13–17. ISBN 978-0-87170-496-2. ↑ Lumley, Roger (2010). Fundamentals of Aluminium Metallurgy: Production, Processing and Applications. Elsevier Science. p. 42. ISBN 978-0-85709-025-6. ↑ Mortensen, Andreas (2006). Concise Encyclopedia of Composite Materials. Elsevier. p. 281. ISBN 978-0-08-052462-7. ↑ The Ceramic Society of Japan (2012). Advanced Ceramic Technologies & Products. Springer Science & Business Media. p. 541. ISBN 978-4-431-54108-0. ↑ Slesser, Malcolm (1988). Dictionary of Energy. Palgrave Macmillan UK. p. 138. ISBN 978-1-349-19476-6. ↑ Supp, Emil (2013). How to Produce Methanol from Coal. Springer Science & Business Media. pp. 164–165. ISBN 978-3-662-00895-9. ↑ Ertl, Gerhard; Knözinger, Helmut; Weitkamp, Jens (2008). Preparation of Solid Catalysts. John Wiley & Sons. p. 80. ISBN 978-3-527-62068-5. ↑ Armarego, W.L.F. ; Chai, Christina (2009). Purification of Laboratory Chemicals. Butterworth-Heinemann. pp. 73, 109, 116, 155. ISBN 978-0-08-087824-9. 1 2 3 4 5 6 7 8 Helmboldt, O. (2007). "Aluminum Compounds, Inorganic". Ullmann's Encyclopedia of Industrial Chemistry. Wiley-VCH. doi:10.1002/14356007.a01_527.pub2. ISBN 978-3-527-30673-2. ↑ Ryan, Rachel S.M. ; Organization, World Health (2004). WHO Model Formulary, 2004. World Health Organization. ISBN 978-92-4-154631-7. ↑ Occupational Skin Disease. Grune & Stratton. 1983. ISBN 978-0-8089-1494-5. ↑ Galbraith, A; Bullock, S; Manias, E; Hunt, B; Richards, A (1999). Fundamentals of pharmacology: a text for nurses and health professionals. Harlow: Pearson. p. 482. ↑ Papich, Mark G. (2007). "Aluminum Hydroxide and Aluminum Carbonate". Saunders Handbook of Veterinary Drugs (2nd ed.). St. Louis, Mo: Saunders/Elsevier. pp. 15–16. ISBN 978-1-4160-2888-8. ↑ Brown, H.C. (1951). Reductions by Lithium Aluminum Hydride. Organic Reactions. 6. p. 469. doi:10.1002/0471264180.or006.10. ISBN 978-0-471-26418-7. ↑ Gerrans, G.C. ; Hartmann-Petersen, P. (2007). "Lithium Aluminium Hydride". Sasol Encyclopaedia of Science and Technology. New Africa Books. p. 143. ISBN 978-1-86928-384-1. ↑ M. Witt; H.W. Roesky (2000). "Organoaluminum chemistry at the forefront of research and development" (PDF). Curr. Sci. 78 (4): 410. Archived from the original (PDF) on 6 October 2014. ↑ A. Andresen; H.G. Cordes; J. Herwig; W. Kaminsky; A. Merck; R. Mottweiler; J. Pein; H. Sinn; H.J. Vollmer (1976). "Halogen-free Soluble Ziegler-Catalysts for the Polymerization of Ethylene". 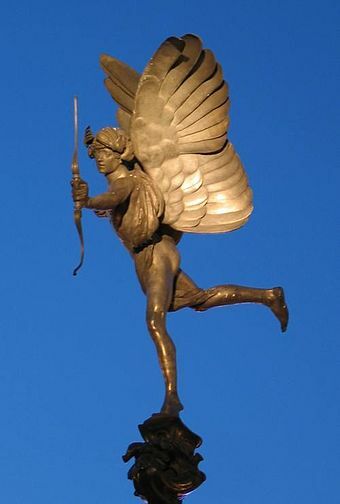 Angew. Chem. Int. Ed. 15 (10): 630. doi:10.1002/anie.197606301. ↑ Aas, Øystein; Klemetsen, Anders; Einum, Sigurd; et al. (2011). Atlantic Salmon Ecology. John Wiley & Sons. p. 240. ISBN 978-1-4443-4819-4. ↑ Singh, Manmohan (2007). Vaccine Adjuvants and Delivery Systems. John Wiley & Sons. pp. 81–109. ISBN 978-0-470-13492-4. 1 2 Exley, C. (2013). "Human exposure to aluminium". Environmental Science: Processes & Impacts. 15 (10): 1807–1816. doi:10.1039/C3EM00374D. PMID 23982047. 1 2 3 4 5 6 7 8 9 10 11 Dolara, Piero (21 July 2014). "Occurrence, exposure, effects, recommended intake and possible dietary use of selected trace compounds (aluminium, bismuth, cobalt, gold, lithium, nickel, silver)". International Journal of Food Sciences and Nutrition. 65 (8): 911–924. doi:10.3109/09637486.2014.937801. ISSN 1465-3478. PMID 25045935. ↑ "ATSDR – Public Health Statement: Aluminum". www.atsdr.cdc.gov. Retrieved 2018-07-18. 1 2 Balch, Phyllis A. (2006). Prescription for Nutritional Healing. Penguin. pp. 183, 192–193. ISBN 978-1-58333-236-8. ↑ Aluminium and Alzheimer's disease Archived 11 March 2012 at the Wayback Machine , The Alzheimer's Society. Retrieved 30 January 2009. ↑ "Alzheimer's Disease and Aluminum". National Institute of Environmental Health Sciences. 2005. Archived from the original on 3 February 2007. ↑ Hopkin, Michael (21 April 2006). "Death of Alzheimer victim linked to aluminium pollution". News@nature. doi:10.1038/news060417-10. ↑ Darbre, P.D. (2006). "Metalloestrogens: an emerging class of inorganic xenoestrogens with potential to add to the oestrogenic burden of the human breast". Journal of Applied Toxicology. 26 (3): 191–197. doi:10.1002/jat.1135. PMID 16489580. ↑ Banks, W.A. ; Kastin, A.J. (1989). 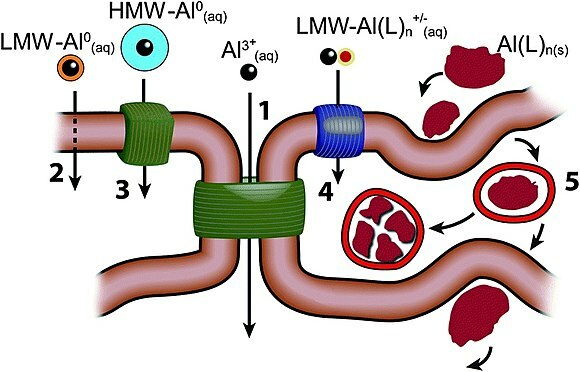 "Aluminum-induced neurotoxicity: alterations in membrane function at the blood–brain barrier". Neurosci Biobehav Rev. 13 (1): 47–53. doi:10.1016/S0149-7634(89)80051-X. PMID 2671833. ↑ Bingham, Eula; Cohrssen, Barbara (2012). Patty's Toxicology, 6 Volume Set. John Wiley & Sons. p. 244. ISBN 978-0-470-41081-3. ↑ "Aluminum Allergy Symptoms and Diagnosis". Allergy-symptoms.org. 2016-09-20. Retrieved 2018-07-23. ↑ al-Masalkhi, A.; Walton, S.P. (1994). "Pulmonary fibrosis and occupational exposure to aluminum". The Journal of the Kentucky Medical Association. 92 (2): 59–61. ISSN 0023-0294. PMID 8163901. ↑ "CDC – NIOSH Pocket Guide to Chemical Hazards – Aluminum". www.cdc.gov. Archived from the original on 30 May 2015. Retrieved 11 June 2015. ↑ "CDC – NIOSH Pocket Guide to Chemical Hazards – Aluminum (pyro powders and welding fumes, as Al)". www.cdc.gov. Archived from the original on 30 May 2015. Retrieved 11 June 2015. ↑ Yokel R.A.; Hicks C.L. ; Florence R.L. (2008). "Aluminum bioavailability from basic sodium aluminum phosphate, an approved food additive emulsifying agent, incorporated in cheese". Food and Chemical Toxicology . 46 (6): 2261–2266. doi:10.1016/j.fct.2008.03.004. PMC 2449821 . PMID 18436363. ↑ United States Department of Health and Human Services (1999). Toxicological profile for aluminum (PDF) (Report). Retrieved 2018-08-03. 1 2 3 4 "Aluminum". The Environmental Literacy Council. Retrieved 2018-07-29. ↑ Chen, Jennifer K.; Thyssen, Jacob P. (2018). Metal Allergy: From Dermatitis to Implant and Device Failure. Springer. p. 333. ISBN 978-3-319-58503-1. ↑ Slanina, P.; French, W.; Ekström, L.G. ; Lööf, L.; Slorach, S.; Cedergren, A. (1986). "Dietary citric acid enhances absorption of aluminum in antacids". Clinical Chemistry. 32 (3): 539–541. PMID 3948402. ↑ Van Ginkel, M.F. 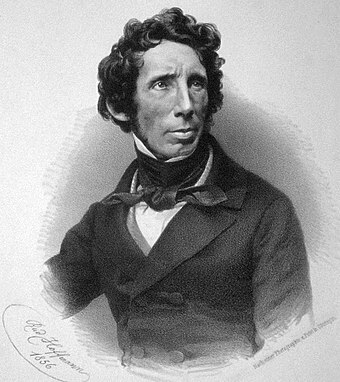 ; Van Der Voet, G.B. ; D'haese, P.C. ; De Broe, M.E. ; De Wolff, F.A. (1993). "Effect of citric acid and maltol on the accumulation of aluminum in rat brain and bone". The Journal of Laboratory and Clinical Medicine. 121 (3): 453–460. PMID 8445293. 1 2 3 "ARL: Aluminum Toxicity". www.arltma.com. Retrieved 2018-07-24. 1 2 "ATSDR – Public Health Statement: Aluminum". www.atsdr.cdc.gov. Retrieved 2018-07-28. 1 2 3 Rosseland, B.O. ; Eldhuset, T.D. ; Staurnes, M. (1990). "Environmental effects of aluminium". Environmental Geochemistry and Health. 12 (1–2): 17–27. doi:10.1007/BF01734045. ISSN 0269-4042. PMID 24202562. ↑ Belmonte Pereira, Luciane; Aimed Tabaldi, Luciane; Fabbrin Gonçalves, Jamile; Jucoski, Gladis Oliveira; Pauletto, Mareni Maria; Nardin Weis, Simone; Texeira Nicoloso, Fernando; Brother, Denise; Batista Teixeira Rocha, João; Chitolina Schetinger, Maria Rosa Chitolina (2006). "Effect of aluminum on δ-aminolevulinic acid dehydratase (ALA-D) and the development of cucumber (Cucumis sativus)". Environmental and Experimental Botany. 57 (1–2): 106–115. doi:10.1016/j.envexpbot.2005.05.004. ↑ Andersson, Maud (1988). "Toxicity and tolerance of aluminium in vascular plants". Water, Air, & Soil Pollution. 39 (3–4): 439–462. doi:10.1007/BF00279487 (inactive 2019-03-07). ↑ Horst, Walter J. (1995). "The role of the apoplast in aluminium toxicity and resistance of higher plants: A review". Zeitschrift für Pflanzenernährung und Bodenkunde. 158 (5): 419–428. doi:10.1002/jpln.19951580503. ↑ Ma, Jian Feng; Ryan, P.R. ; Delhaize, E. (2001). "Aluminium tolerance in plants and the complexing role of organic acids". Trends in Plant Science. 6 (6): 273–278. doi:10.1016/S1360-1385(01)01961-6. PMID 11378470. ↑ Magalhaes, J.V. ; Garvin, D.F. ; Wang, Y.; Sorrells, M.E. ; Klein, P.E. ; Schaffert, R.E. ; Li, L.; Kochian, L.V. (2004). "Comparative Mapping of a Major Aluminum Tolerance Gene in Sorghum and Other Species in the Poaceae". Genetics. 167 (4): 1905–1914. doi:10.1534/genetics.103.023580. PMC 1471010 . PMID 15342528. ↑ "Fungus 'eats' CDs". BBC. 22 June 2001. Archived from the original on 12 December 2013. ↑ Bosch, Xavier (27 June 2001). "Fungus eats CD". Nature. doi:10.1038/news010628-11 (inactive 2019-03-07). Archived from the original on 31 December 2010. ↑ Sheridan, J.E. ; Nelson, Jan; Tan, Y.L. "Studies on the 'Kerosene Fungus' Cladosporium resinae (Lindau) De Vries: Part I. The Problem of Microbial Contamination of Aviation Fuels". Tuatara. 19 (1): 29. Archived from the original on 13 December 2013. ↑ "Fuel System Contamination & Starvation". Duncan Aviation. 2011. Archived from the original on 25 February 2015. Wikimedia Commons has media related to Aluminium . Wikisource has the text of the 1911 Encyclopædia Britannica article Aluminium .